Morton Thiokol was not the name of one of the astronauts aboard the Challenger spacecraft that blew up twenty-five years ago today (January 28, 1986). But that name is as important as any associated with the mishap / tragedy. Morton Thiokol was the name of the company based in Ogden, Utah that manufactured the ‘O’ rings on the solid-fuel rocket booster, one of which failed at 11:39 AM that morning, 73 second after lift-off. If you want more of the unpleasant details of the malfunction, you’ll have to look elsewhere. There were lessons to be learned after and even before that fateful day. There are still new ones to learn. One concerns Morton Thiokol. First, I must give a slight spelling correction by adding a hyphen, make it Morton-Thiokol. This clarifies that we are talking about a company, not an individual. The O-rings manufactured by Morton-Thiokol had worked on all previous twenty-four shuttle flights. But all of those launches took place with a temperature of at least 51 degrees Fahrenheit. At 11:38 AM that morning, the temperature and Launch Pad 39B was 36o. An egregious mistake had been made by at least two parties: the government-run NASA and the private company Morton-Thiokol. Morton-Thiokol knew that there was risk in maintaining the integrity of the O-ring at such a low temperature, but so did NASA which had ultimate responsibility for the launch and oversight of the work done by Morton-Thiokol. Following the disaster, there was a great deal of finger-pointing between the two entities. Today, the argument goes on, but on a much broader playing field. On one side is the public sector as represented by NASA and on the other side is the private sector as represented by Morton-Thiokol. We often talk in positive terms about a public-private partnership, but the Challenger disaster was a partnership of mutual responsibility and negligence. We can argue until the cows come home as to who was “more to blame,” Morton-Thiokol or NASA. The bottom line is that human beings in each organization made decisions that had disastrous consequences. There is no evidence that anyone operated with malice, just negligence. As President Obama and others have pointed out, our dialogue has frequently become debate without civility. Ironically the last period of time in which people with honest disagreements minimized the personal attacks may have been during Ronald Reagan’s presidency, which was when the Challenger disaster occurred (remember Ronald Reagan and Tip O’Neill being true friends). It’s quaint that Democrats and Republicans sat with one another during President Obama’s State of the Union Speech, but unity that goes beyond symbolism is what we really need. A good place to start is from what we can learn from the Challenger disaster. What happened on and before that cold January day was a series of human errors. Some of the individuals who made mistakes were in the private sector; others were in the public sector. What they had in common was that they were human beings who were fallible and subject to the pressures of achieving excellence while working within deadlines. It’s quite likely that if the Morton-Thiokol people had been working for NASA and the NASA people for Morton-Thiokol, the exact same mistakes would have been made. The partisan debates seem to overlook the reality that all of us, including those who are pontificating, make mistakes. We screw up; it’s part of the human experience. A little less certainty and a little more humility might be helpful. This does not mean that we should drowse off into a bi-partisan kumbaya; besides being impossible it would take a lot of the spice out of life. The public – private issue is important, fundamental to the decisions we make. I prefer to err on the side of public because its constituency is everyone as opposed to stockholders and executives. But if businesses were taken out of the mix, it would stifle an enormous amount of individual initiative and fulfillment. We lost some wonderful people on the Challenger. While Concord, New Hampshire teacher Christa McAuliffe is most remembered, the other six crew members were also exceptional. Fortunately we remember Christa McAuliffe and we honor others such as Ronald McNair, one of the first African-American astronauts. Besides the brave astronauts, it is important to remember that the accident reflected the omnipresence of human fallibility. Sometimes we forget that; sometimes we forget the flip side of Challenger; the dreams that the astronauts and others had to further explore space. 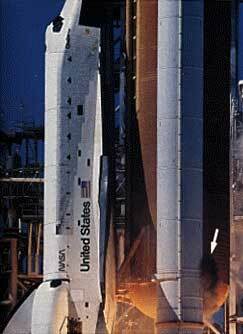 The twenty-fifth anniversary is particularly poignant because American manned space is about to enter a hiatus of undetermined length. As irony would have it, the scheduled commander of the final shuttle flight is Mark Kelly, husband of Congresswoman Gabrielle Giffords whose shooting represents so many of the unresolved issues in our country. She’s alert and thinking and I bet she’d be thrilled to hear that a new public-private partnership has been forged without acrimony to continue the space program. What a fine way to try to mend so many of our wounds.